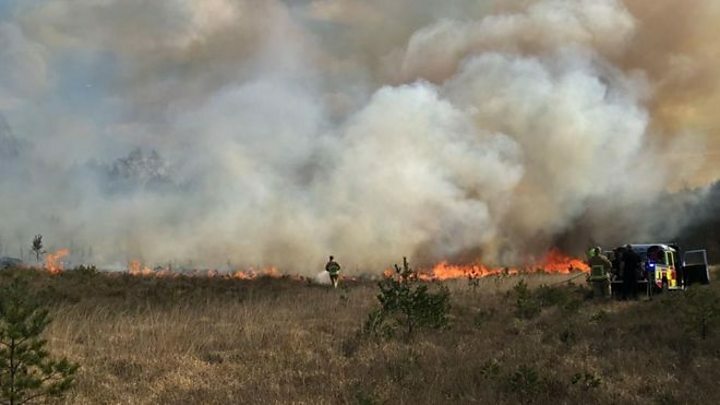 A fire on the largest national nature reserve in the south-east of England has had a "devastating" effect on wildlife, a charity has warned. Sarah Bunce from the Thames Basin Heath Partnership said it was a crucial time for wildlife on the healthland. "Reptiles will have come out of hibernation and birds are beginning to nest," she said. "It's the timing that's so devastating." Ms Bunce said the common was home to all six native species of reptiles - adders, grass snakes, smooth snakes, common lizards, sand lizards and slow worms. She said rare species of birds including nightjars nested on the ground in areas around Woking, Guildford and Camberley. "A fire at this time of year can be very devastating." A spokeswoman for the Thames Basin Heaths Partnership, a project focused on protecting the Thames Basin Heaths Special Protection Area, said it had been a "very sad day" for reptiles and invertebrates at the common. The RSPB said more than 100 different species of birds had been recorded on the site including the Dartford warbler, hobby, buzzard, woodlark and woodcock. At its height on Monday about 40 firefighters were tackling the blaze and crews remained damping down the scene on Tuesday. Surrey Fire and Rescue Service said crews were continuing to monitor the area affected by the blaze.